(BRANDYWINE, Md.) – Data Solutions & Technology Incorporated’s Lynette Jones hosted NBC Washington chief meteorologist Doug Kammerer at her backyard barbeque on Friday, August 5, 2011. 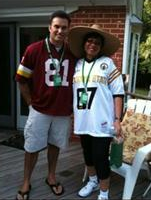 The theme for the event was Washington Redskins versus the Dallas Cowboys. Lynette and many of her DST family, including President and CEO Deborah Scott Thomas, enjoyed a scrumptious feast while Doug forecasted the weekend weather for News4 viewers. The barbeque extravaganza can be seen on the Internet. The first two segments can be viewed by clicking here and here. Another segment, titled “Doug’s Host Steals the Show,” can be viewed online as well by clicking here. Additionally, click here to view pictures from the backyard barbeque festivities. If you are interested in hosting Doug in your backyard send him an e-mail at [email protected] and include the following items: your name and location; the reason why he should join you for some backyard barbeque fun; a picture of your backyard; and a phone number. For more information about visit the NBC Washington website at www.nbcwashington.com/weather or click here. Copyright ? 1994 - 2018 Data Solutions & Technology Incorporated. All Rights Reserved.